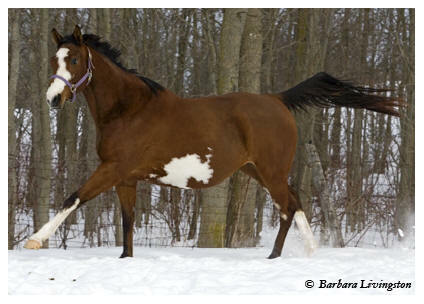 Black Oaks Paris (aka Bling) is a flashy bay sabino Thoroughbred mare born April 30, 2003. She is an athletic mare with awesome hunter movement. She is very people orientated and passes this trait onto her babies. She has had one palomino colt Golden Oaks (aka Beau) by Guaranteed Gold in 2007. In 2008 she had Calipso, a beautiful sabino buckskin colt by imported Cremello German Warmblood stallion Mirabeau. Bling has dual registration with the Jockey Club and the American Paint Horse Association. Black Oaks Paris was approved by the Rheinland-Pfalz-Saar-International in September 2008. Her colt, Calipso went Premium Silver at this inspection. She is a granddaughter of Puchilingui, a very loud bay sabino Thoroughbred stallion, acknowledged as being one of the most prolific and consistent color producers. 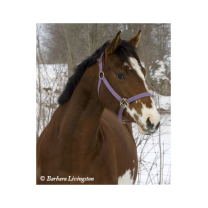 She is a daughter of Puchi’s Rambo, who belonged to James and Jacquelyn Burke of Cross Creek Sport Horses as the sole owners of him for his entire breeding career, until his untimely death in 2004.